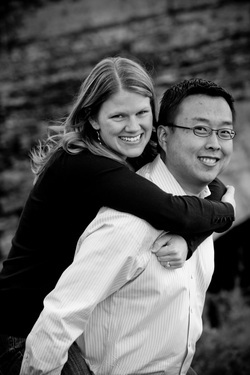 Jenny and Will have lived together in the Twin Cities since 2007 and we were recently married in August of 2010. We love the metropolitan dining scene and appreciate all that the Twin Cities have to offer. We took the name for our blog from the Chinese word hao chi, which means tastes good or literally "good eats" or "good taste". We like to thing we have both! Will is a General Mills employee and lived in Minneapolis at three points in time (2000-2004, 2005 and 2007-present). He grew up in Wausau, WI and has lived in Madison, WI; Boston, MA; Scottsdale, AZ; Taipei, Taiwan; and Beijing, China during various times in his life. Will is a proud UW-Madison and Harvard Business School alum and an avid baseball fan. Jenny is a nurse practitioner locally, received her Master's degree at the University of Minnesota and has lived in Minneapolis since moving here in 2006. She grew up in La Crosse, WI, is a life-long Green Bay Packers fan and has lived in Scottsdale and Madison as well.